The Beatles 50 Years Ago Today: February 11, 1968. Beatles Radio: The Beatles, Solos, Covers, Birthdays, News The Fab 4 and More! Just days before they were due to fly to India to study meditation with Maharishi Mahesh Yogi, The Beatles recorded Hey Bulldog, a brand new John Lennon song, during the filming of a promotional clip for Lady Madonna. The group gathered in Abbey Road's Studio Three at 4pm to be filmed by NEMS employee Tony Bramwell. While there, The Beatles decided to put their time to good use, and recorded the new song. In fact, three separate clips were edited from the footage, and variously included effects such as filters, double exposures, and extra material filmed at the session for Cilla Black's song Step Inside Love, written by Paul McCartney and recorded in November 1967. The most common Lady Madonna clip begins with an overhead shot of Ringo Starr on drums, and ends with footage of McCartney from the Step Inside Love session, picking up his coat and guitar and leaving the studio. A lesser-seen variation begins with Starr in a coat and tie and features George Harrison eating a plate of beans. A third version was created for Anthology in the 1990s, combining elements from both clips plus footage from the 30 July 1968 session for Hey Jude. Hey Bulldog was recorded in 10 takes, with Lennon on piano, McCartney shaking a tambourine, Harrison on rhythm guitar and Starr on drums. McCartney then overdubbed a bass guitar part onto track two of take 10, accompanied by Harrison playing the main riff on a distorted guitar and additional off-beat snare drum from Starr. 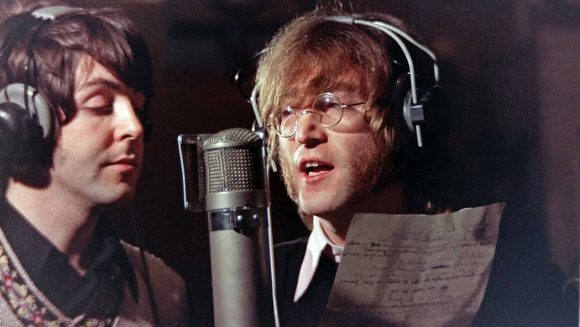 Lennon and McCartney then shared a single microphone to record the vocals, reading from Lennon's handwritten lyrics. This included banter and howling during the song's ending. I remember Hey Bulldog as being one of John's songs and I helped him finish it off in the studio, but it's mainly his vibe. There's a little rap at the end between John and I, we went into a crazy little thing at the end. After Bramwell had finished filming, final overdubs were added. These included the lead guitar solo, performed on George Harrison's Gibson SG Standard, although the identity of the player is uncertain. Once recording was complete, two mono mixes of Hey Bulldog were made. The second of these was then given to King Features, who made an animated sequence for the Yellow Submarine film to accompany the song. The mixes were made with the tape machine running slightly faster - 51 cycles per second rather than the usual 50 - which raised the pitch and tempo of the song slightly. Artificial double tracking (ADT) was also used. That was a really fun song. We were all into sound texture in those days and during the mixing we put ADT on one of the 'What did he say? Woof woof' bits near the end of the song. It came out really well.